France, the birthplace of cinema, is acknowledged for having a strong film industry, because of the protections and advancements ensured by the French government. Many French actors have been reaching wider audience up to now by featuring in both popular and critically-acclaimed movies, not just in French films, but in Hollywood films, theater and television shows as well. Some of them even excel as singers. Such actors who made names both in French cinema and Hollywood are Maurice Chevalier who was nominated for the Academy Award for Best Actor for his roles in The Love Parade (1929) and The Big Pond (1930), Michèle Morgan who played opposite Frank Sinatra in the film Higher and Higher back in 1942, Georges Guétary, who was best known in the United States for his performance as Henri Baurel in An American in Paris, and MichelinePresle, who was cast by director Fritz Lang opposite Tyrone Power in the war drama American Guerrilla in the Philippines in 1950 among others (Mayer). Some of them use English as their L2 or their second language. Perhaps one of the most popular French actors in this modern day who are also in Hollywood is Julie Delpy, who played one of the leads in the romantic hit film Before Sunrise, as Celine, a French woman, who also utilizes mostly English throughout the film. Before Sunrise is an American romantic drama film directed by Richard Linklater in 1995. The film follows Jesse, played by Ethan Hawke, a young American man and Celine, played by Julie Delpy, a young French woman, who meet in the train and get off in Vienna, where they spend the night walking around the city talking about life and love, and getting to know each other. The film received high critical praise at the time of its release, and was even entered into the 45th Berlin International Film Festival where director, Linklater, won the Silver Bear for Best Director. Celine, the character of Delpy, exhibits an interesting English variety in the film, which is French English. Hawke’s American English variety is a foil to Delpy’s, and both varieties demonstrate some important differences between the French phonology and American English phonology. Delpy is a French-American actresss, film director, screenwriter, and singer-songwriter who was born at Paris, France. After moving to the United States in1990, she became an American citizen in 2001 (“Julie Delpy Biography”). Her L1 or first language is French and her L2 is English, which is strengthened by her exposure to the language while studying filmmaking at NewYork University’s Tisch School of the Arts in the US. Delpy’s L1 (French) exhibits significant influence on her L2 (English) and this is demonstrated in her character Celine in Before Sunrise. The phenomenon of transfer is showed in Delpy’s pronunciations of Celine’s lines. French pronunciations of English words are notably different from that in American English. For example, French has a [ʁ] sound while English has a [ɹ] sound. These two sounds are written in the same way as “r” in prose, but are pronounced differently and according to Koutsoudas and Koutsoudas, “French speakers would want to substitute their [ʁ] sound for the English [ɹ] sound for the word red” (54). Some phones change in French English. This is because of the transfer happening between the French and English languages. As defined by George Yule, transfer, is the “using [of] sounds, expressions or structures from the L1 [or first language] when performing in the L2 [or second language]” (191). 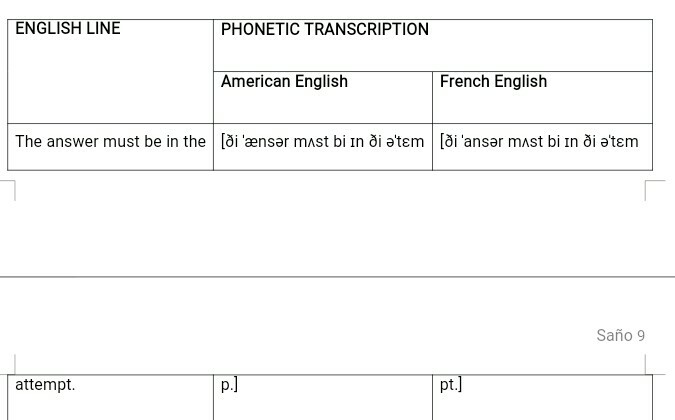 The phonetic inventories of American English and French differ; some phones in American English phonetics do not occur in French phonetics, as shown in these phoneme inventories in Figure 1 and 2. A phoneme inventory includes all the distinct sounds, consonants and vowels, in a given language. 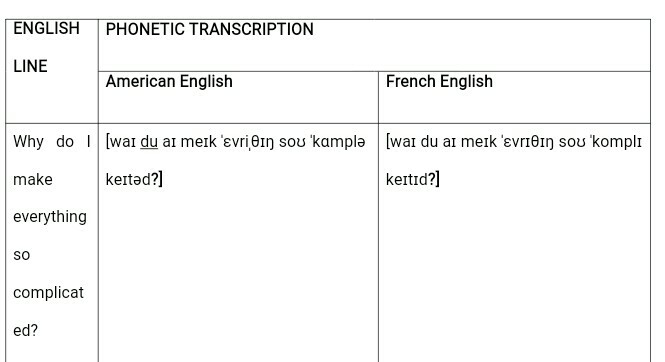 In Figure 1 below, the consonant phoneme inventory for French is given in the first column and the consonant phoneme inventory for English is given in the second column. Figure 2 gives the vowel phonemes of French and American English (Campbell 417 & 469). Figure 2.Vowel phoneme inventories for French and English. As shown from the figure, the consonant phonemes [θ], [ð], [h], [ŋ], [ʍ], [tʃ], [dʒ], and [ɹ] occur in English but do occur in French. Transfer is caused by the collision of the American English’s and French’s phonetic inventories. This phenomenon occurs in the English lines uttered by Julie Delpy’s character, Celine, in Before Sunrise. The researcher’s objectives are to analyze the phonological features of the English lines uttered by the French character, Celine, in Before Sunrise and to examine the effects of Celine’s L1 (French) on her L2 (English), mainly by dissecting how French speakers overlook certain American English rules, because of the transfer happening between the two languages. This study is limited only to the notable American English rules overlooked by Celine in Before Sunrise — Aspiration Rule, Tap Rule, Velarization Rule and Final Consonant Release. There are some American English rules that illustrate consonant pronunciation and the overlooking of these rules is common for French speakers of English because of their differences with the French rules. The fist rule is that voiceless stops /p t k/ in English are aspirated in word initial position and syllable initially before a stressed vowel. Aspiration Rule: Voiceless stops become aspirated at the beginning of the word or stressed syllable. According to George Yule, “aspiration is the puff of air accompanying the [t] sound at the beginning of words such as tar” (43). In the same positions, the French counterparts are unaspirated. Therefore, French speakers may be pronouncing words like person, differently because in English /p t k/ are aspirated but in French they would be unaspirated. As shown in the table, Celine’s pronunciation of the initial /p/ sound in the word, person, is unaspirated as opposed to the American English version where the initial /p/ sound of the same word is aspirated. As shown, [ˈpʰɜrsən] in American English is [ˈpɜrsən] in French English. The second rule deals with the American English tap. In American English, when an alveolar stop /t d/ is the single consonant between two vowels, the second of which is unstressed, then it becomes a tap. Tap Rule: An alveolar stop becomes a tap when it is a single consonant between two vowels the second of which is unstressed. In the word ability in American English, the [t] becomes a /r/ because it is between two vowels, the second of which is unstressed. French does not have a flap allophone of /t d/ that English has. Therefore, it may suggest that instead of pronouncing the wordability with a tap, the French would pronounce it with a full [t] closure. British English also doesn’t have the tap allophone and ability would be pronounced the same way that native French speakers are predicted to, with the full [t] closure. In Celine’s line above, she pronounced ability without a tap. Instead, as predicted, she pronounced the word with the full [t] closure although /t/ is sandwiched between two vowels. Here, [əˈbɪləri] in American English is [əˈbɪlɪti] in French English. The third rules deals with the [l] sound. The English [l] has two allophones. The first is before front vowels and is produced by a distinct contact of the tip of the tongue against the alveole (Valdman 39). The second /l/ allophone is velarized and occurs everywhere else. According to Peter Ladefoged, “Velarization is a secondary articulation in which the back of the tongue is raised toward the soft palate” (298). Velarization Rule: [l] becomes velarized everywhere except before front vowels. French only has a single front allophone for /l/ which is always produced with contact of the tip of the tongue with the inner side of the upper front teeth. It can be predicted that French speakers would have trouble producing the velarized English /l/ since they do not have it in their own language. They would most likely pronounce all English [l] sounds in the same manner with the front allophone for /l/ regardless of the sound’s location. In the given line by Celine, in the word complicated, the /l/ is supposed to be velarized in American English because /l/ is not before front vowels /i/ or /e/ in both environments however, Celine pronounced /l/ in the same manner with the front allophone for /l/. [ˈkɑmpləkeɪtəd] in American English is [ˈkomplɪkeɪtɪd] in French English. It is also shown here that [ˈkomplɪkeɪtɪd] in French English does not have any stress unlike the American English version which has a stress in the first syllable. The fourth and final rule also looks at the voiceless stops /p t k/. In American English, voiceless stops are normally not released for some speakers in final position whereas in French there might be an audible release. Final consonant release: Voiceless stops in final position are unreleased. Celine’s pronunciation of the word attempt from the line above exhibited a Final Consonant Release. [əˈtɛmp] in American English is [əˈtɛmpt] in French English. The unreleased final /t/ sound of attempt in American English is released in French English. These four rules are not the only phonological differences between American English and French. For example, many French centre and front vowels use rounded lips, whereas in English they would be made with neutral lips. Also, French has just one close front vowel [i], English has two: /ɪ/ and /i:/ – /ɪ/ should be made with a slightly lower jaw, but French speakers often just use the one position for these vowels. Lastly, French contains one open vowel unrounded: [a], English contains 2: /æ/ (cat) /ɑ:/ (cart) so French often the French [a] instead (“10 English Pronunciation”). But, these differences are not noticeable in Celine’s lines in the film. France has a very rich and tight film culture and it has been home of many talented French actors who are making names by appearing and even starring not just in French cinema, but also in Hollywood. Such French actress is Julie Delpy who most notably played the French character of Celine in the romantic hit, Before Sunrise opposite another Hollywood star, Ethan Hawke. Aside from the entertainment, the film also offers an interesting phonological foil between the two actors of different ethnicity. Hawke’s Jesse uses the American English variety while Delpy’s Celine uses the French English variety. Delpy’s character, Celine, exhibits the influence of her L1 (French) on her L2 (English), demonstrating the phenomenon of transfer. In order to analyze this further, a contrastive view of the phonology between American English and French is performed by dissecting how French speakers overlook certain American English rules, because of the transfer happening between the two languages. Such American English rules which are analyzed are Aspiration Rule, Tap Rule, Velarization Rule and Final Consonant Release. Varieties of languages occur because of many factors and in Julie Delpy’s French English variety, the variation happened because of the phonological influence of her French on her English. But, this variety should not be considered as better or less than other English varieties. It does not reflect social status or power. Rather, it just demonstrates how language can still vary and evolve in many ways through the clashes of the phonological features of different languages. “Biography.”IMDb.IMDb.com, n.d. Web. 07 Dec. 2016. Campbell, George L. Compendium of the World’s Languages. Vol. 1.N.p. : n.p., n.d. Print. “French Speakers’ English Pronunciation Errors.” Pronunciation Studio.N.p., 2015. Web. 07 Dec. 2016. Ladefoged, Peter. A Course in Phonetics. Boston: Thomson Wadsworth, 2006. Print. Mayer, Alicia. “7 French Actors Who Made It Big In Hollywood’s Golden Age #1.”Playbuzz.N.p., 2015. Web. 07 Dec. 2016. Valdman, Albert. Introduction to French Phonology and Morphology. Rowley, MA: Newbury House, 1976. Print. Yule, George. The Study of Language. Cambridge, UK: Cambridge UP, 2006. Print. These recent weeks for me has been very eventful. We went to places outside QC (hi EK), attended birthdays, watched important events at UP [Pag-iilaw (Ebe Dancel! ), Oblation Run, etc. ], galas and acads. And there’s more dates to come. It’s funny how I often vent here about not having an eventful life but really, I just do that when I miss doing something outside home. And I just realized that I do go out a lot. Maybe I’m just too cynical to notice those little things that make my life eventful. Maybe I’m just thinking that “eventful” is immediately synonymous with “something major” like a concert or whatnot, but that’s almost impossible and that’s just wishing for so much. I read a quote somewhere that goes along the lines of, “Happiness will happen to you if you just lower your expectations.” I’ve been doing that lately — lowering my expectations in many aspects of my life, and I figured that it’s quite healthy. I’ve always been the kind of person who have high hopes. I expect too much. I’m ambitious. Maybe it doesn’t show on the surface but I am. Someone told me that I look like the happy-go-lucky type. Someone who doesn’t really have a direction in life, and that’s kind of true. But really, I’m just uncertain about what person am I going to be in the future. I wanted to be a lot of person at the same time. But it all falls down to philanthropy. I’ve always wanted to do that. I always want to show people that they are appreciated and they are special, because I’m having trouble with that too, and it hurts a lot when you feel that you’re not appreciated and that you’re really just a speck in the dust— that you’re insignificant. But, life’s too short to whine about negativities. And unhealthy, too. My Spanish professor, Prof. Jennifer Ozoa, who I adore so much, asked the class once: “Have you ever tried changing yourself? It’s hard, right?” It is. It really is hard, especially if you have been a cynical, excessively guarded person for a long time. How can you transition right away into this positive, ray of sunshine person that you’ve always wanted to be? It’s hard but I’ll try. Approximately, I need 60 days to form a habit. It’s a long time. An hour and a half is too long already for me, so 60 days would be undoubtedly hard. But in order to really grow as a person, I have to help myself improve.